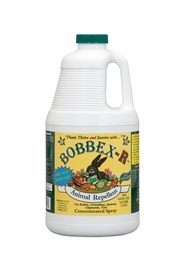 Bobbex-R is a year round product for all types of plantings, will not wash off during rain, irrigation or normal watering. It is environmentally compatible and harmless to humans, pets, birds and aquatic life, contains no petro-chemicals, and is made from natural and recycled ingredients. Mix with water into a pressurized sprayer, will make up to 4.5 gallons of mixture using our spring/summer mixing ratio and 2.25 gallons using our fall/winter mixing ratio.